Qingdao Tauna Packing Machinery Co., Ltd. 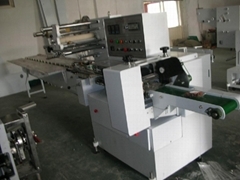 Being a privated holding company, China Qingdao Tauna Pack Machinery Company is specializing in designing, developing, manufacturing and marketing of a great variety of wrapping machinery. The company is credited as top level of packaging machinery industry in China in terms of advanced technology and senior technical engineers. An advanced management mode is carried out in the course of daily management, operation and quality control, so that we made a great progress in our products quality and progress. 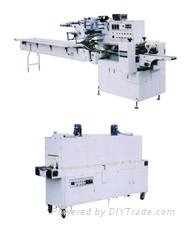 China Tauna Packing Machinery Company manufactures a full line of film sealing machinery including more than 10 varieties of machines such as fully automatic horizontal pillow pack wrapping machine, ３sides sealed pillow pack wrapping machine, automatic heat shrink wrapping machine, automatic wrapping machine without pallet, and so on to meet a wide range of applications in food, diary, pharmaceutical, biscuits, cakes, and bakery products as well as soaps industries.